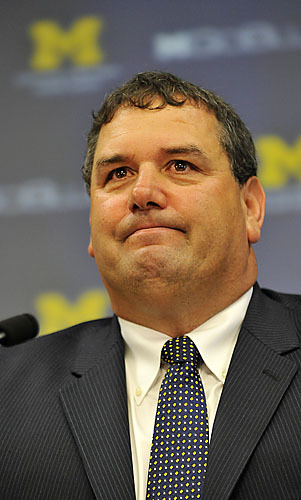 Sometimes you have to give credit where credit is due- Brady Hoke and his Michigan program did very well on the recruiting trail this past weekend. The weekend was so good, in fact, that the rest of the Big Ten- and especially those of us in Buckeye Nation, need to sit up and take notice. On top of the numbers is the quality- every last one of the eight verbals was a four-star prospect according to Rivals. This type of success, particularly head-to-head with the Buckeyes, is a far cry from what we had all come to expect and enjoy during the Rodriguez era. Is it time for the Big Ten to panic? With Meyer’s close to the 2012 class and this opening for Hoke’s 2013 class- probably. Is it time for Buckeye Nation to panic? The answer to that is a resounding no, but this weekend sent a clear message. Just yesterday the official Ohio State Athletics website posted an updated depth chart for the Buckeyes. There were some big changes, though many were fully expected. Of particular note were the losses of Jamaal Berry (cut for off-field issues) and David Durham (transfer to Pittsburgh). But the question that still lingers is the one of Oversigning. Ohio State fans and media have been justifiably wringing their hands since the moment that Urban Meyer started recruiting like crazy. It’s not unusual around this time for Buckeye fans to worry about oversigning, particularly considering how badly they view the practice. To see the Buckeyes commit such an act would be incredibly shameful for nearly everyone. Accounting for scholarships, though, is a tricky business. Whether a player has maintained their scholarship over the course of time, particularly if they’ve remained a walk-on, is hard to figure out. It’s also difficult to keep track of which walk-ons have managed to pick up scholarships during the course of time. Plus, the constant addition and subtraction of players through transfer and recruiting just adds another level of complication. With the Buckeyes still hunting after one additional recruit, we have been told by Urban Meyer that there are currently 81 scholarship players on the team. Those numbers would leave one available scholarship in the 2012 recruiting class if his accounting is correct. Of course, there’s still a player out there that Meyer thinks could fill that spot. Stefon Diggs, a Wide Receiver/Defensive Back recruit out of Maryland, is scheduled to announce his college destination this evening. Where he is going, currently a battle between Maryland, Ohio State, and Florida, has been a hotly contested topic of conversation on Twitter and college football recruiting boards across the country. Diggs would be a huge addition to any recruiting class, and would be the kind of significant playmaker that could see the field quickly in a big way. We’re Stars- With the Senior Bowl nigh upon us, we’ve been hearing good things about the former Buckeyes in attendance. Mike Adams, in particular, is getting rave reviews; his form and size have many projecting him into the first round. Mike Brewster has been, according to report, owning Michigan’s Mike Martin (what else is new? ), and things are getting a bit chippy between the two. DeVier has been rumored to have a case of the dropsies, and we haven’t heard much from Boom as of yet. Crunching Numbers At Crunch Time- Even though we’ve hit a lull in the Urban Meyer Recruiting Cavalcade, there are still worries that Ohio State might have some issues when it comes to making the 2012 class fit under the 82 scholarship limit imposed by the NCAA. The Dispatch takes a close look at the numbers, while the OZone’s Brandon Castel has some insider information on some of the attrition that usually happens when there’s a change in coaching. While we (and our friends at Oversigning.com) will be watching the numbers closely to see if there are any SEC shenanigans, it should be remembered that this is not something Urban’s been wont to do. Oh, and Cincinnati has over thirty current verbals. I guess Ohio’s BCS team is trying to become Ohio’s SEC team. You Will Comply- The Lantern has an update on the move to make athletic compliance a part of the larger University oversight. With Urban Meyer at the helm, recruiting optimism and momentum have reached unprecedented levels across Buckeye Nation. PA DE Noah Spence is the latest in a series of recruiting victories that have skyrocketed the 2012 class into one of the top groups in the country. While the defensive line haul has reached historically awesome heights over the past week or so, there are still some pressing needs moving forward. Most notably, the 2012 class is still missing the premiere offensive tackles that are so clearly needed in the coming seasons. In addition to offensive tackles, Urban Meyer will work to add depth at linebacker and to find some difference makers on offense over the final weeks before signing day. Here is the latest news on the remaining targets in the 2012 class. It has been an amazing few days for Ohio State recruiting- possibly even the best few days in at least the past decade if not longer. To recap, after a dynamite recruiting weekend, Urban Meyer has locked up three elite nationally ranked prospects. Meyer successfully flipped Tommy Schutt from Penn State, Se’Von Pittman from Michigan State, and secured Brionte Dunn from the clutches of that school up north. The best news of all, however, is that Meyer is not done yet. Here is a look at the top ten remaining targets on Ohio State’s recruiting board. Tommy Schutt is a Buckeye!! Illinois defensive tackle Tommy Schutt has officially switched his commitment from Penn State to Urban Meyer and the Buckeyes, becoming the 16th member of the 2012 class (not counting Dunn). Tommy Schutt is one of the top defensive linemen in the country (scout 5-star, rivals 4-star, who cares what the clowns at ESPN rate him) who will be a tremendous addition to Ohio State’s interior defensive line. With the opportunity to go to his choice of Mid-West schools, Schutt was heavily pursued by Ohio State early in the recruiting cycle. Unfortunately, his interest seemingly fell off after Jim Tressel was no longer head coach. Ultimately, he chose Penn State over Notre Dame and Michigan, but obviously the situation in Happy Valley has caused many of their prospects to look around. It didn’t take long for the mutual interest sparks to fly between Schutt and Ohio State after Urban Meyer became head coach, and following a tremendous visit this weekend, Tommy decided to officially switch his commitment to the Buckeyes. Hopefully this is just the start of a series of reversals from players who visited over the weekend (Pittman, Dodson). Either way, Tommy Schutt is a tremendous addition to the 2012 class and Urban Meyer’s first commitment as Ohio State’s head coach. Good weekend for the good guys. By most reports, this weekend went just about as well as it possibly could have for Ohio State and their 2012 recruiting effort. OH OL Kyle Dodson, IL OL Jordan Diamond, IL DT Tommy Schutt, OH DE Se’Von Pittman, and OH RB Brionte Dunn. OH RB Warren Ball, OH WR Frank Epitropoulos, OH WR Roger Lewis, OH TE Blake Thomas, OH OL Jacoby Boren, OH OL/DL Patrick Elflein, OH LB Josh Perry, OH LB Luke Roberts, OH DB Devan Bogard, OH DB Najee Murray, and OH DB Tyvis Powell. As you can see, there was plenty of pro Buckeye sentiment represented to help persuade the not-quite-Buckeyes. Trying to keep track of where Urban Meyer and his staff are currently at on the recruiting trail and who the recruits are that might fill out the 2012 and 2013 class keeps one from getting any work done these days. Let’s just put it this way…Jim Tressel was a good to great recruiter. Under his watch, the Buckeyes signed a ton of playmakers. At the same time, there were things that left a lot to be desired. Obviously the results on the field speak for themselves, but any recruitnik out there knows exactly what I am talking about. The days of Tressel recruiting are over, and as much as we will miss him as Ohio State’s head coach, these are truly exciting times. Urban Meyer loves this stuff, and that makes it a lot of fun for the fans as well. With Thad Matta and Urban Meyer at the helm of our Basketball and Football programs, look for exciting recruiting stories and surprises to just keep coming out. Down the stretch things are going to change a lot with the 2012 class until signing day. Getting Meyer in November is the most important thing in terms of finishing out the 2012 class with a bang. Just look what he has done to the recruiting board in only a week. I have seen final numbers predicting anywhere from 4-8 spots left. Lets play with the assumption that we have 8 to give because that is more fun…even though it means we will see some attrition through medical hardships and transfers.